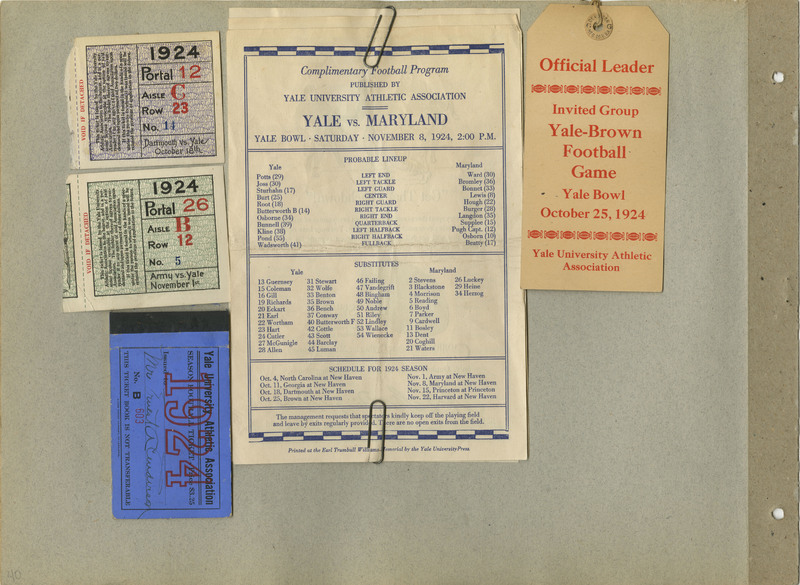 This football program has the team players names and numbers for Brown University and Yale University as well as the schedule for 1924. The reverse is an advertisement for A.G. Spalding & Bros. Outdoor Clothing Store on Fifth Avenue, New York, NY. 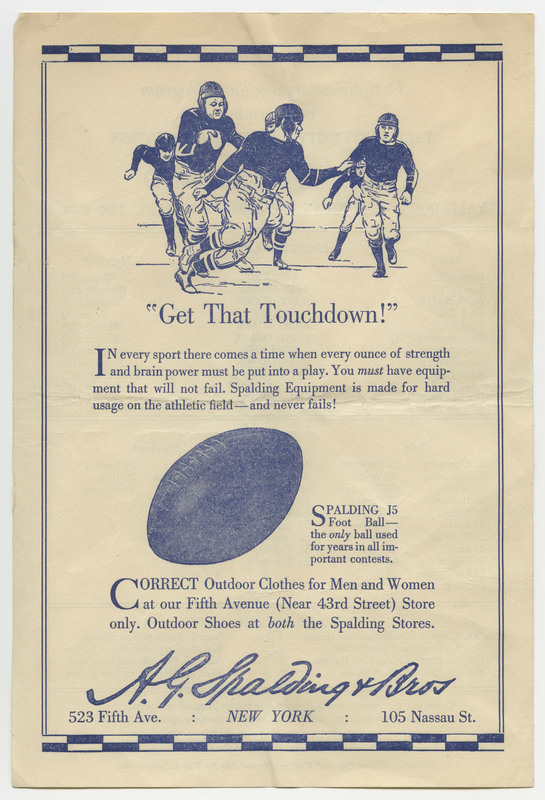 As the items concerning Ruth Dorcas Gates’ social activities and sports attendance all date to the years 1923 to 1925, and it is unknown whether the copyright were renewed in the cases in which still existing organizations are involved (Y.W.C.A., Yale University Football, etc. ), it is assumed that materials of still existing organizations are under copyright unless known otherwise. The material may still be accessed strictly for pedagogical use. Undated materials are presumed to be from the year 1925 or earlier, as the scrapbook’s latest material dates from that time. 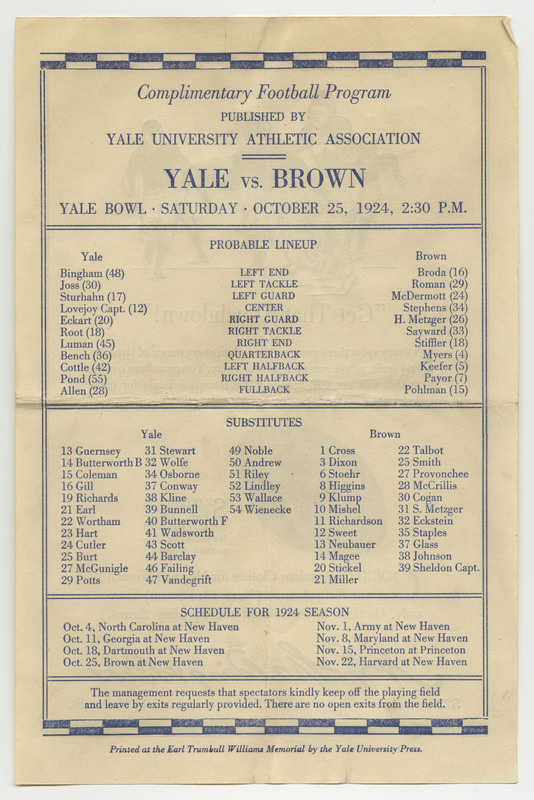 Yale University Athletic Association, “Program for Yale vs. Brown Football Game at the Yale Bowl,” The Ruth D. Gates Digital Scrapbook, accessed April 19, 2019, https://slis.simmons.edu/ruthgates/items/show/393.